Charring meat on the grill can produce some potentially harmful substances. (Health.com) -- When the dog days hit Boston, Massachusetts, Stephanie Meyers starts cooking alfresco to keep things cool indoors. Meyers grills--a lot--and as a nutritionist at the Dana-Farber Cancer Institute, she's well aware that charring meat over an open flame produces cancer-causing substances (known as carcinogens) that may be harmful when eaten. So to make grilling healthier, she sticks to the same advice she gives her patients. Unlike meat, vegetables don't create carcinogens when they char. But the small cancer risk associated with grilling meat isn't so great that you need to forgo hamburgers, hot dogs and steaks altogether. Taking a few precautions while barbecuing will minimize the health risks without sacrificing that delicious charcoal taste, experts say. Grilling protein-filled foods such as meat and fish creates two kinds of chemical compounds that may contribute to cancer: heterocyclic amines (HCAs) and polycyclic aromatic hydrocarbons (PAHs). HCAs form in meat when it's cooked at a high temperature. While frying and broiling produce these chemicals as well, those charred bits at the edges of barbecued meat contain HCAs in their purest state. HCAs, which are also found in cigarette smoke, have been shown to cause cancer in organs including the stomach, colon, liver and skin--but only in animal studies. It's unclear whether HCAs cause the same problems in people. Still, the U.S. Department of Health and Human Services has stated that the chemicals are "reasonably anticipated to be human carcinogens." PAHs, the second type of compound, are formed when juices from meat drip onto coals or other hot surfaces and create smoke. The smoke contains these carcinogens, which are deposited onto the surface of meat as it swirls around the food. Colleen Doyle, the director of nutrition and physical activity for the American Cancer Society, says the risks these two substances pose shouldn't make die-hard grillers put away their oversized utensils for good. "From our perspective, there has not been enough definitive research that would cause us to tell people not to grill at all," she says. But there are ways to minimize your exposure to carcinogens when grilling, Doyle adds. She recommends cleaning the grill prior to cooking, which will remove any charred debris that may stick to food. And if some parts of the meat you're cooking get badly charred, cut those pieces off. In addition, precooking food slightly before grilling will help cut down on PAHs. Meyers recommends placing meat in the microwave and zapping it for between 60 seconds (for leaner cuts) and 90 seconds (for thicker, fattier pieces). This reduces the amount of time the food is on the grill and allows some of the juices to drain beforehand. And whenever possible, Meyers recommends grilling vegetables or fruits instead of meat. The carcinogens in charred meat aren't the only health concern associated with barbecues. 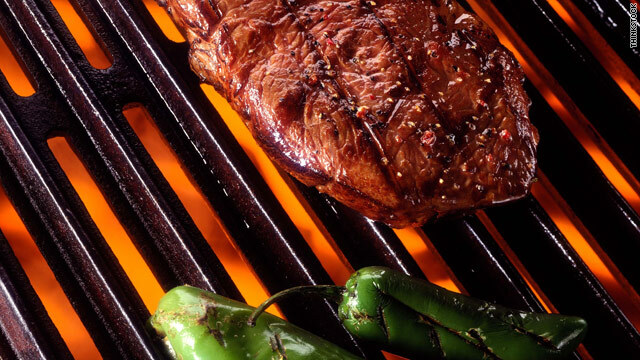 Though for many people the smell of a juicy steak wafting from the grill is synonymous with the onset of summer, the smoke that carries the aroma is less desirable. A 2003 report from researchers at Rice University, in Houston, Texas, found that grilling creates "ambient fine particulate matter"--air pollution, in other words. Although backyard barbecues add far less pollution to the atmosphere than cars and factories, this particulate matter can still cause problems. In concentrated amounts, the smoke from a grill can trigger respiratory trouble in people with lung diseases such as asthma or chronic obstructive pulmonary disease (COPD). "Anyone who is sensitive to smoke should avoid exposure to a grill--or fire, or trucks," says Paul Billings, the vice president of advocacy at the American Lung Association. "They should protect themselves by limiting their exposure to whatever the source is that irritates their lungs." Billings recommends cooking over natural gas or propane grills to reduce the pollution emitted. If you own a charcoal grill, using a chimney starter instead of lighter fluid will also keep you from inhaling harmful chemicals, he says. Buying lean cuts of meat, trimming off most of the fat and wrapping foods like fish in a foil packet will all help cut down on smoke by reducing the amount of juices that drip onto the grill. Although at-home chefs should always try to grill as safely as possible, Meyers emphasizes that you shouldn't let the health risks of barbecuing spoil your appetite. "Keep the risk in perspective," she says. "Grilled foods are not the greatest cancer risk--not wearing sunscreen while at the grill is a bigger deal. If you like to grill, put meat on the grill and use the safety tips."